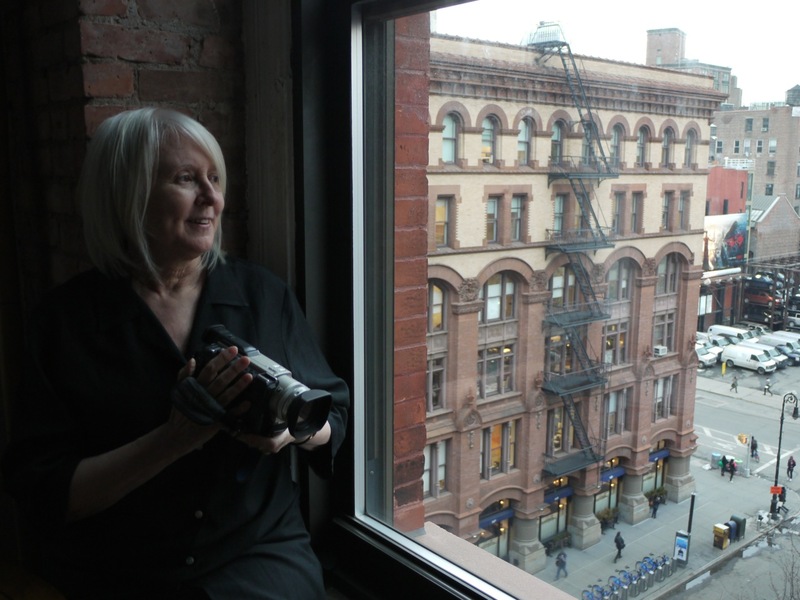 Mary Oestereicher Hamill is a pioneer of participatory photo-based art regarding social issues. In a multi-year project begun in the 90s, she loaned video cameras to homeless people and transformed the imagery and sound into collaborative interactive installations at the Museum of Fine Arts, Boston; Sanders Theatre, Harvard; and the Massachusetts State House. Her seminal Constructs of Frailty (Rose Art Museum) led to a medical mission in remote rural Vietnam; and this resulted in a collaborative exhibition in the village center and an installation at Stanford University. Her expedition to ancient Beijing neighborhoods engendered street photography by the residents and a festive art display there; this phase was followed by projecting the China images outdoors in Chinatown, New York, and then exhibiting the entirety at the Danforth Museum. Hamill collaborated with Native Americans in New Mexico for the Abiquiu Music Festival. She also developed an installation based on her service as a Public Affairs Officer on the hospital ship USNS Mercy in the South China Sea. Currently she and Chath pierSath, a survivor of the Khmer Rouge killings, direct the Cambodia War Widows Project. Her artwork has been exhibited in Canada, England, France, India, Spain, Uruguay and other countries. Hamills consistent focus on the needs of poor and marginalized people proceeds from a career in educational reform, work that led to four national awards and to a set of U.S. legislation (PL94-142). She served as Senior Research Scientist in the New York Mental Health system, tenured Associate Dean of Undergraduate Studies at Brooklyn College, and Associate Professor of Psychology and Dean Undergraduate Studies at Babson College, where she led an acclaimed curriculum reinvention. Hamill has a Diploma from the Museum School and the Traveling Scholar Award, and has had numerous fellowships including Djerassi Resident Artist Program and Virginia Center for Creative Arts. She earned the Ph.D., Columbia University; M.Phil., University of Sussex, England; and A.B., University of Michigan. In 2014 the national Womens Caucus for Art appointed her representative to the United Nations. The mother of two adult sons, she is based in New York City and Princeton and is Artist/Scholar at Brandeis University Womens Studies Research Center. Fellow, Djerassi Resident Artists Program, Woodside, CA, 2012, 2011 and 2006. Resident, Virginia Center for the Creative Arts, 2004. "Traveling Scholar, 2003-04" by Museum of Fine Arts, Boston, and the School of the Museum of Fine Arts. 93rd recipient of the Ruth A. Sturdivant Award. Tyre Foundation Awards, 2010 and 2007. Dean's Grant, School of the Museum of Fine Arts, 2003. “regardisregard: a collaboration with men and women who are homeless,” Hunterdon Art Museum, Clinton, NJ. April-September, 2018. Curator Majorie Nathanson. “After Genocide: Cambodian War Widows Project,” Bernstein Gallery, Woodrow Wilson School of Public and International Affairs, Princeton University, with Chath pierSath a collaboration with widows. September, 2015. "Abiquiu Blanket,” Abiquiu Chamber Music Festival, New Mexico, August, 2010..
“regardregard: project china/chinatown” multimedia installation, Danforth Museum of Art, March, 2009. Curator Katherine French. “Here, There, and Everywhere,” Boston, April, 2009. (catalog) Curator Mary Sherman. “TraDong Vietnam where there is no doctor” video after August 2006 public exhibition at village cultural center in Quangnam province. January, 2007. “regardisregard” 7. Multimedia presentation featuring words and images of and by the homeless, with composition by Ruth Lomon sung live by Boston Secession in benefit for Cambridge Housing Assistance Fund, Sanders Theatre, Harvard University, September, 2006. “Sand Dance” and “Barn Dance” videos with choreography and dance by Martin Inthamoussu and Gabriel Calderon, music with Jasna Jovicevic, and poetry by Tina Chang. Nosideoedison Gallery, Montevideo, Uruguay, October, 2006. “regardisregard” 6. a collaboration with the homeless. Multimedia and webcam installation, Traveling Scholars Exhibition, Foster Gallery, Museum of Fine Arts, Boston, February and March, 2004. Juried by Jane Farver. "regardisregard" 1. a collaboration with the homeless. Performative installation, Massachusetts State House, Boston, March 2003. "What Water Tells Me," video in collaboration with Ruth Lomon original composition Music performed by Auros, Pickman Auditorium, Longy School of Music, April, 2001. "Constructs of Frailty," installation with music performed by Boston Secession, Rose Art Museum, Waltham, March, 2001. Juried by Michael Rose. “Reporting Fine Art,” Charles Kraus Gallery, Washington, DC, 2017. “Nation II at the Alamo,” Sideshow Gallery, Williamsburg, New York, 2018, 2017, 2015, 2014. Curator Richard Temperio. "Chess--Adjustable Objects VI, VII, VIII, and IX," Medialia Gallery, New York, January, 2010, 2011, 2012, 2013, 2014, 2015, 2017, 2018.Curator Mashiko Nakashima. Artwork included in video : "Women Artists Consider Our World"
United Nations Commission on the Status of Women 2015 Conference. “Visual Syntax: Book Art,” Medialia Gallery, New York, April 2013 Curator Mashiko Nakashima. “Who’s Afraid of Feminism,” A.I.R. Gallery, Brooklyn, New York, catalog September, 2015. Juried by Catherine Morris. Princeton Arts Council, Robeson Arts Center, September 2015. France; Wingfield, England, 2010, 2012, 2013 (catalogs). “Passion” and “Provocateur,” New York Public Library at Lincoln Center, 2013, 2015. Presented activist art projects at United Nations 2014 Conference on the Commission on the Status of Women, New York. Filmmakers Showcase Virginia Center for Creative Arts, Virginia Museum of Fine Art, Richmond, Virginia; Auvillar, France; New York, New York. 2011, 2012. “Convergences,” Kniznick Gallery, Brandeis University, 2012. “Distressed,”, La Galeria, Boricua College, New York, 2012. “Wish You Were Here” A.I.R. Gallery, Brooklyn, New York, 2012. “Backlash,” Soho 20 Chelsea Gallery, New York, 2012. ‘The Coaster Project” Transcultural Exchange, Toronto, 2012.Juried by Mary Sherman. "Cairns," Kniznick Gallery, Brandeis University, June-October, 2009. "Dead Video/Live Video Festival," Boston Cyberarts Festival, Pozen Center, Massachusetts College of Art, May, 2009. "The Tile Project, Destination the World" sponsored by TransCulturalExchange and United Nations in KU Art Center, Beijing, August, 2008.
International Video Festival, Women's Caucus for Art, Waltham, February 2006. "Visions of Active Citizenship," Tufts University College, 2005-6. "Boston 375," Boston City Hall and Logan International Airport, 2005-6. "Art in Life," Tressider Union, Stanford University, PaloAlto, CA, October, 2004. Jurors Nathan Olivera, Leo Holub, Kara Maria . "Film and Video Annual," Remis Auditorium, Museum of Fine Arts, Boston, May, 2001. 2000 North American Sculpture Exhibition, Foothills Art Center, Golden, CO, May-July, 2000.Juried by Alison Saar. Carpenter Center Summer Show, Harvard University, Cambridge, MA, 1999. “Project Chinatown.” With Immigrant Movement International and United Nations. New York, December, 2011.Juried by Tania Bruguera. “Cairns: Proportional Representation,” Installation series, Boston, February, 2009. “regardregard 2: project china/chinatown.” Video projections, New York City, November, 2008. “regardregard” 1. a collaboration with the elderly hutong community. Photographic installation, YanYue Community Center, Beijing, August, 2008. “regardisregard” 5. a collaboration with the homeless. Installation with audio, international conference of Women’s Institute for Policy Research, Washington, DC, June, 2003. "Tributary," Performative installation with Ruth Lomon original composition for three flutes, Brandeis University pond, May, 2000. "River Buoys," Installation, on the Muddy River at the Museum of Fine Arts, Boston, March, 2000. Co-Director, Bernstein Gallery, Woodrow Wilson School of Public and International Affairs, Princeton University, 2015-present. Artist/Scholar, Women's Studies Research Center, Brandeis University, 1996-present. Representative to United Nations from national Women’s Caucus for Art, 2014. Associate Dean of Undergraduate Studies, and tenured Assistant Professor, Brooklyn College, City University of New York, 1980-1992. Project Manager, Research and Demonstration Center, Teachers College, Columbia University, New York. 1975-1977. Instructor, John Jay College, Department of Communications Skills, 1974-1975. Senior Research Scientist, New York State Department of Mental Hygiene. Championed client to forge Public Law 94142. 1968-74. Instructor, Wayne State University, Department of English, 1967-1968. Ph.D., Psychology, Columbia University, 1980. Dissertation: On the contribution of category context to visual word recognition of exemplars: a developmental study. M.Phil., English, University of Sussex, England, 1977. Dissertation: On George Eliot and the Meanings of Middlemarch. A.B., Religion & English, University of Michigan, 1964. With freshman year at Stanford University 1960-61, and post-baccalaureate study at Hunter College, 1969. School of Museum of Fine Arts Fifth Year Certificate, 2003 (teaching assistant to Magdalena Campos-Pons). School of Museum of Fine Arts Diploma, 2001. (98-99 studied intermediate and advanced painting with Paul Stopforth at Tufts). Haystack Mountain Workshops with Bai Ming (ceramics) 2016 and Claire Sherman (painting) 2017. Documentary Photography Workshop with Ed Kashi, Anderson Ranch, Aspen, CO, August 2012. Art in Amsterdam Workshop with Charles Goss, Wacker Academy of Art, Amsterdam, July, 2009. New media workshop and show with Andy Zimmerman, Massachusetts College of Art, Spring, 2006. Public intervention workshop and fieldwork, Santa Fe Art Institute, December, 2006. Harvard University, DES, Mixed Media Seminar, Summer, 1999. Unitewomen.org, Women’s Rights: An Artist’s Perspective, Arc and Line, 2013. Mandell, Fred, Becoming a Life Change Artist, pp. 202-205, Penguin Group, 2010. Rosenzweig, R, "Mother Art and Maternal Health" Journal of the Association for Research on Mothering, Canada: York University Press, 2009. "Aged in China," Here, There and Everywhere: Anticipating the Art for the Future, Boston: TransCultural Exchange, 2009. Feeney, Mark, "From Paris to China to Space, a Shift in Focus" Boston Sunday Globe, April 11, 2009. Bergeron, Chris. "Global Exploration at the Danforth," The Daily News, March 29, 2009. Totty, Heather Holt, "World-Class Art in Framingham," AAAHorizons, New England, March, 2009. Davidson, Susie, "State House show to feature city's homeless people," Cambridge Chronicle, March 12, 2003. Ericson, Bethany, “Art as Dialogue at MFA: Hamill achieves a rare democratic engagement with her art,” Cambridge Chronicle, March 4, 2004. Sweeney, Emily, "An insider's look at homelessness," The Boston Globe, Thursday March 13, 2003. Sweeney, Emily, "Survivors, but barely so: An exhibit probes world of homeless," Boston Sunday Globe, March 23, 2003. Pulse Field, International Archive of Sound Art, Georgia State University, 2002 ff. Cleary, David, “Auros for New Music,” 21st Century Music, September, 2001.